We started off bright and early today. After a quick breakfast we headed to the train station to travel from Milan to Genoa. It was an easy train ride to Genoa, but unfortunately there wasn’t enough time to watch Shrek on the train. We took a bus to our hotel and met our Genoa tour guide. Then we headed out to learn the rich history of Genoa. We had time to get lunch and then we started walking through the city. We got the opportunity to learn the history of Genoa as well as see its beautiful architecture. The inside of the Cathedral of Saint Lawrence was especially gorgeous. We even had time to stop for gelato during the tour to get out of the hot sun. 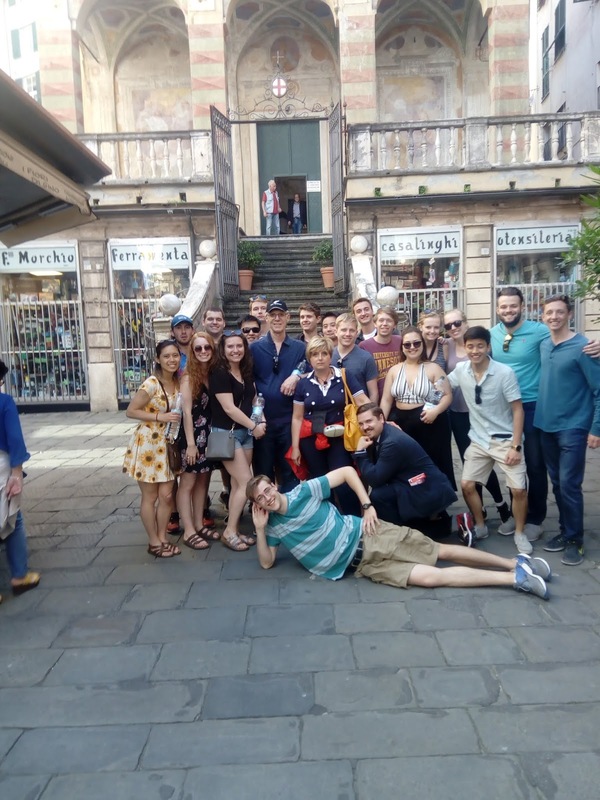 Our introduction to Genoa was fantastic and our guide, Donatella, did a wonderful job leading us through it. Our hotel is extremely close to the beach, so when we got back some of us walked over. The view of the Mediterranean Sea was stunning. After a long and tiring day, we all headed to 5 Maggio for a group dinner. There were lots of laughs and the food was fantastic, of course.